Just pick it up and play with it: I've barely strummed a guitar, but an acoustic blues player I know tells me I should just jump in and starting picking and playing, to get a feel for the sound and the instrument. (For inspiration, Martin offers a "Play Me" wall full of guitars you can take down and play while you're at the factory site.) That's exactly how you should step into social media: Pick an instrument (site or application) and start playing with it. The tools are designed to be intuitive in many cases, and making mistakes is a great way to learn. That goes not only for your first forays into social media, but whenever you encounter a new app or site. 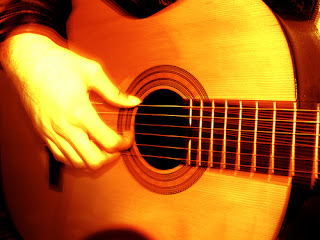 Attach yourself to a pro: In addition to seeking lessons, one of my guitarist friends suggested I find a player I admire and ask him or her for some lessons--even a professional player. (Wonder if Bonnie Raitt's available?) In the same vein, some training or coaching can help you come up to speed faster on social media skills, or help you hone a particular skill or approach. You're not too old to learn: Encouraging guitarists all have told me not to hesitate to start learning now, much as I encourage social media waverers to take the plunge. What's age got to do with it? In social media, technology favors the late adopter, making applications easier and more functional with every update; that may be why baby boomers are fast becoming the growth factor behind sites like Facebook, and Twitter's populated by more middle-aged folks than youngsters. Let's hope the same is true for guitars. Let me know if you want to add a social media training or a strategy-setting retreat to your agenda; email me at info[at]dontgetcaught[biz].